Cleaning your RV can be a tiring, stressful, costly, and daunting task – or does it have to be? While it may be true that cleaning at least the exterior of your RV is tiring due to its size alone, keeping the interiors and some parts of the exteriors clean can be simple with the right cleaning hacks and cleaning tips for your RV. 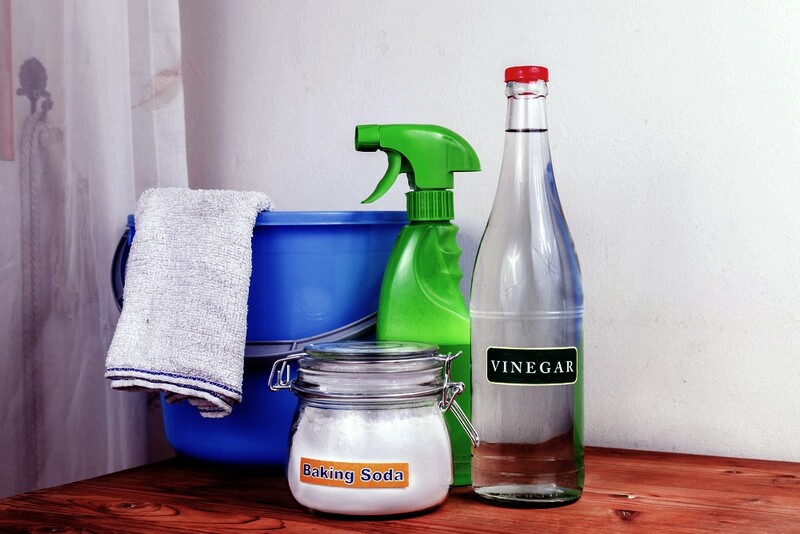 Distilled white vinegar is a cleaning hack that everyone should know about. The properties of vinegar allow it to kill bacteria and remove stains while still being gentle enough as not to damage or destroy whatever it is you are cleaning. The best thing about it is that it is incredibly cheap. It is also available anywhere and it can clean almost everything in your RV. If you have wood surfaces in your RV that is filled with scratches, you can mix ¼ cup of vinegar with ¾ cup of olive oil and then wipe off the marks on the surface. Vinegar is also great for removing water stains. Simply fill a plastic bag with vinegar and cover your RV’s shower head with the bag and secure it with a rubber band. Leave it overnight and simply wipe it clean. The same can be done with your sink or other stainless steel fixtures. It can also be used as a tough cleaner for tiles like in your shower or kitchen by mixing one part vinegar with one part dishwashing soap. The mixture of these two everyday kitchen items works well enough to get most cleaning jobs done! Ironically, no matter how big your RV may be, sometimes it feels like there isn’t enough storage space inside. You can hack your way into more storage space with three simple things: tension rods, a Lazy Susan, and vacuum pack bags. Tension rods are especially great to make more space in cabinets under the kitchen or bathroom sink. 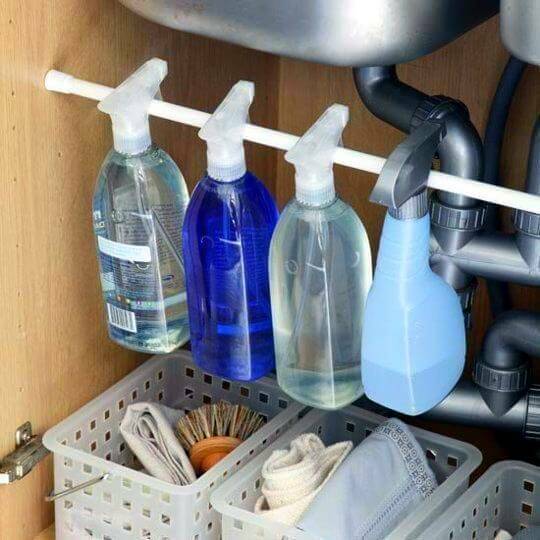 You can hang spray bottles for cleaning on those tension rods or cleaning cloths. Hanging what’s possible, will free up some “floor space” on the bottom of your cabinets for the rest of your items. 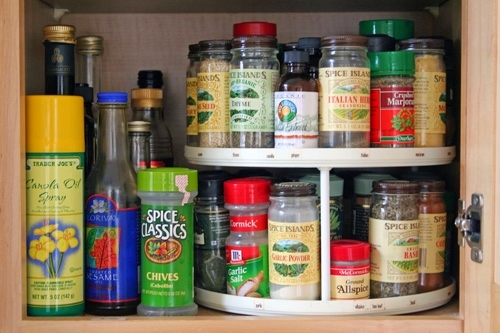 If you haven’t heard of a Lazy Susan, it’s time you do some research. Those nifty little things are great for organizing tight spaces like corner shelves, kitchen cabinets, or even your refrigerator. All you have to do is place your items on it neatly, then spin it around when you need to look for something! 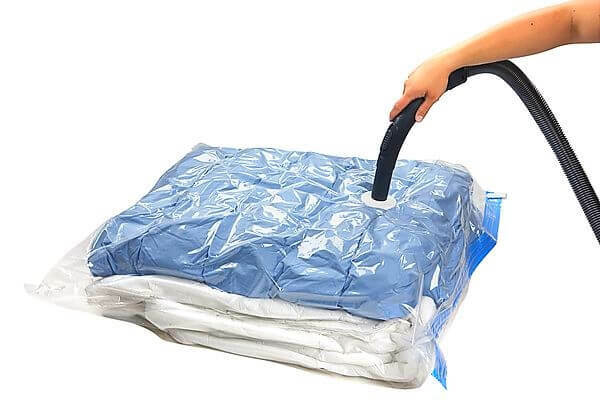 Finally, vacuum pack bags or vacuum-sealed bags are perfect for storing those bulky, yet somehow airy items like winter clothes, blankets, or even pillows you don’t use. Sealing those items in a vacuum pack bag will reduce the amount space it takes by at least half. Voila – extra storage space for you! Those clear, shiny surfaces don’t clean themselves! And if you’re like me, you probably appreciate a clean and clear view to the outside from your RV. You’ll be surprised how much cleaner your RV will look as a whole if the windows are clean. First of all, you need to check if your windows are covered with solar film. If they are, be sure to check the manual or manufacturer’s directions for cleaning so you don’t end up damaging the solar film. 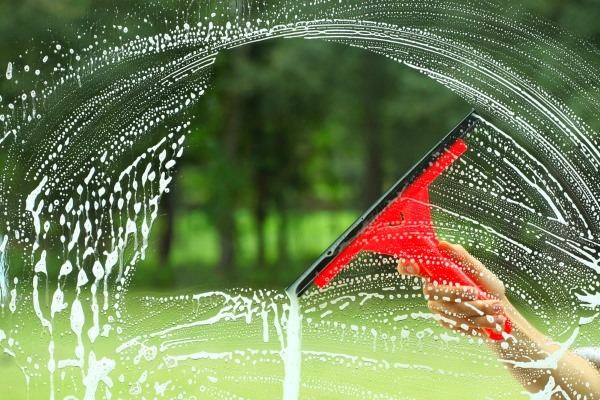 If they aren’t covered in solar film, Windex or any other window cleaner will work fine – including white vinegar. If you want to use white vinegar, just fill your spray bottle with ¼ vinegar and the rest with water. If your window stains are really tough, just add a bit more vinegar. Remember to clean both sides of the window. Don’t forget about the windowsill. Start by vacuuming or sweeping away any loose dirt and then you can wipe the remaining stains with a paper towel and yes, you’ve guessed it – vinegar. When it comes to your shades, blinds, or curtains, clean them carefully. If your RV has blinds, the best thing to do is to take them down, wash them with mild detergent, and then hang it up to dry. Shades, on the other hand, need to be hand-dusted or vacuumed carefully and curtains can be machine-washed. A lot of RVs use leather for their dashboards and upholstery. If this applies to you, then you’ll need to care for them properly. Never, and I mean, never use alcohol to clean leather – you will damage it forever. Get yourself a bottle of vinyl or leather protector and wipe the surfaces thoroughly at least once a month, or depending on what the instructions for the product mentions. 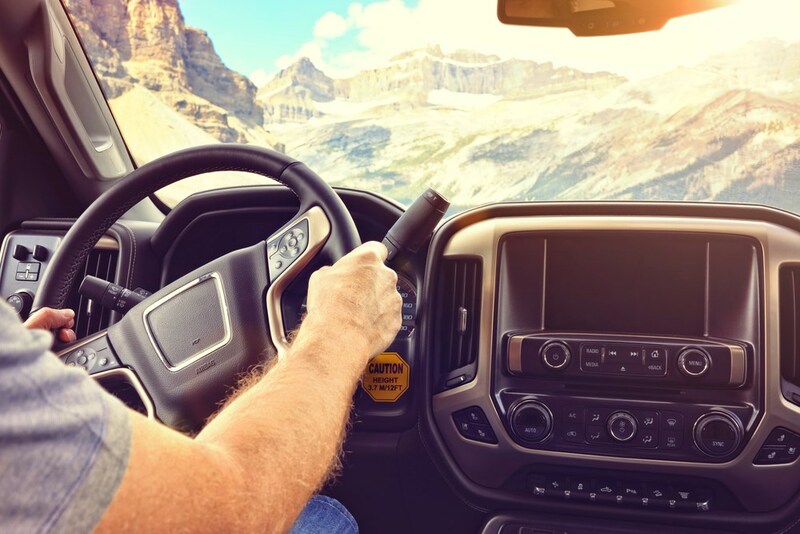 Wipe the steering wheel and foot pedals of the RV as well for a total clean. When it comes to the rubber gaskets protecting windows and doors, check your user manual on proper care and maintenance. 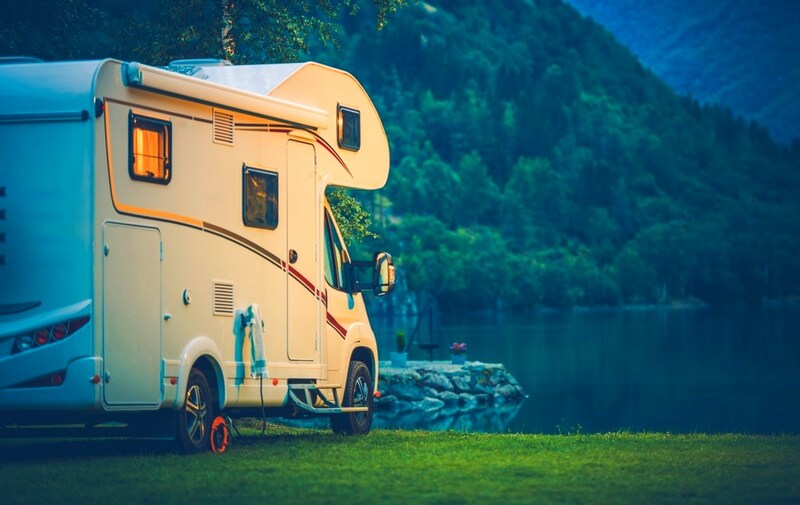 But generally, you can use a silicone-based spray cleaner or protectant to keep it clean and protect it from the sun – especially if you take your RV out a lot during the summer. They say the best offense is the best defense, and in terms of cleaning, that means taking some preventive measures to ensure that your RV doesn’t end up extremely dirty to the point of driving you away from your sanity. The simplest thing you can do is have indoor and outdoor mats and requiring everyone to remove their shoes before entering. Try to find a way to keep your shoe storage near the entrance of your RV so you don’t walk around the entire RV with dirty shoes. This simple action will go a very long way. In the same sense, make it a habit to clean as the mess happens. If you’re cooking for example, as soon as something spills, don’t wait one second and wipe it away immediately. This will save you a lot of time in the future. But when it comes time to clean, the rule of thumb is to clean everything from the top to the bottom. It’s the fastest and most efficient way to clean. nice little trick to ensure that every spot is clean while being very quick and simple to do. The truth is that nothing will stay clean for long, especially your RV. But remember that a clean RV means a comfortable trip that is also safer for your health. After all, your RV is basically your home wherever you go. Since it travels with you, it picks up a lot of dirt along the way so you need to keep it clean as you go. If you do a little bit of cleaning each time and take some preventive measures, it will save you from having to do a total cleaning haul. Hopefully, these simple cleaning hacks and tips will help you out and make your RV trips more enjoyable for everyone! Rita is a wife and mother of two boys; balancing her passion for being outdoors and her family, who she considers her biggest joys in life.